The Greek island of Karpathos is the second largest island in the Dodecanese archipelago, but despite of this only about 6000 people live there. In recent years there has been a considerable increase in tourism on Karpathos, which has given a modern appearance to some parts of the island. The island of Karpathos has a number of very beautiful beaches and is extremely popular with surfers because of its favourable wind conditions. A holiday on Karpathos offers a good combination of sun, sea and sand and culture. As Karpathos has its own airport, it is easy to get there by charter flight. Pigadia, the capital of Karpathos, has developed into a modern little town in recent years. 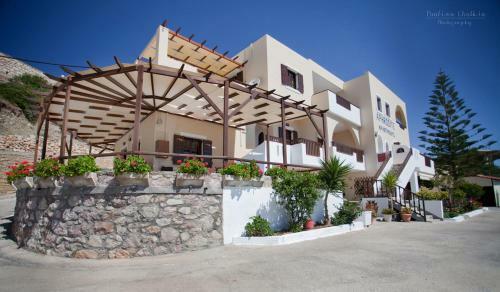 There are many places to stay, numerous taverns, cafes and bars for a varied and entertaining holiday on Karpathos. In comparison to its capital, the northern part of Karpathos is noticeably quieter. The mountain village of Olympos is famous for its traditional life style. It has a few very pleasant taverns and bread is stone-baked in the traditional way. The western beaches of Karpathos offer the most favourable conditions for a wind surfing holiday, while beaches in the east are less windy but tend to be smaller and have pebbles. Most of the sandy beaches are in the south, the majority of northern bays are only accessible by boat. On one of the most scenic coastal parts of the Greek Dodecanese island of Karpathos you will find the picturesque village of Amopi. The west wind sweeping across the mountains in the island’s centre gives the air a transparency only matched by the crystal clear water of the Aegean Sea. Amopi has pebble beaches, one large sandy beach and a variety of charming little bays, just perfect for snorkelling, surfing and scuba-diving. Amopi is not quite the sedate little village it used to be and gets very busy during the tourist season. The village of Arkasa, built along a dried-up river-bed on the rocky Paleokastro Peninsula, lies about 5 miles from the capital of the Greek Dodecanese Island of Karpathos. Halfway between the beautiful sandy beach and the village there are rooms and apartments for hire near a small beach tavern. Those interested in history and archaeology can visit the ruins of Agia Anastasia, a Byzantine Basilica, and admire the cyclopean masonry of Paleokastro. As the harbour of the beautiful and traditional village of Olympos on the eastern coast of the Greek Dodecanese Island of Karpathos, Diafani has hardly been affected by tourism and is an ideal resort for people who want to get away from it all. Main pursuits in this region are mountain-hiking, snorkelling and scuba-diving. Pine-forests and olive groves invite for a relaxing evening walk. For a quiet and relaxed Karpathos holiday, the small fishing village of Finiki is just right. Complete with a patriotic war memorial celebrating local heroes, Finiki has a small beach, a large harbour and traditionally Greek taverns where fresh fish tops the menu – slightly more expensive in the harbour region, but reasonably priced if you dine at Nikos’ tavern, a bit further away from the harbour. Built on the ruins of the Dorian sea-trading town of Poseidion, Karpathos Town or Pigadia is, with a population of 3500, the largest town on Karpathos. The Dodecanese Island’s capital is a perfect base for exploring Karpathos as well as other islands like Rhodes or Crete. Pigadia is popular with tourists, but still has a typically Greek atmosphere, with picturesque narrow lanes, beautiful houses and a little fishing harbour. Bars, discos and traditional bouzuikias in Pigadia provide evening entertainment, and there is a growing number of restaurants and cafes for tourists as well to make sure that your Karpathos holiday will be a success. The tiny traditional village of Lefkos on the west coast of Karpathos consists of Pano Lefkos (Upper Lefkos) and Kato Lefkos (Lower Lefkos) and has managed to escape mass tourism so far. Greek life-style and tradition, historic sights (a Roman cistern, an Ice Age Cave and a church with a cross-vaulted dome) and idyllic beaches (Limani Beach, called after its little fishing harbour, is the most popular one) are the reason why people come to Lefkos for their Karpathos Holiday. Small white houses with blue-and-yellow doors and shutters, narrow lanes and balconies virtually covered in flowers – the small village of Menetes is reputedly the cleanest village on the Dodecanese Island of Karpathos. It is the ideal place for those who enjoy sitting in the shade under lemon trees, drink Greek coffee or Ouzo and chat with the locals.